One of the most important tasks the new business owner must tackle is to create a budget for the new company, so you can see expected income and expenses and cash needs. Your budget is also a key component of your startup business plan. Since you have no past information to go on, you must create the budget using your best guess on income and expenses (otherwise known as a profit and loss statement). This "how to" will focus on business with an inventory of products but it will also discuss a service business with no products. Before you begin, consider why you need to spend the time to create a budget. Even if you don't need bank financing, creating a budget is still a valuable exercise for any new and continuing business. What do you need to open the doors of your business on the first day? What will your fixed and variable costs be on a continuing basis? What can you contribute to keep costs low (furniture, for example)? What can you get as donations from friends and relatives? What can you do without (pictures, decorations)? The less you need for startup, the sooner you can start making a profit. Begin by determining what you will "day one" of your business, in order to open the doors (or take your website live) and begin accepting customers. Facilities costs for your business location - rental or purchase of a store, office, warehouse, etc. If you are working from home, you probably won't have location costs. Facilities costs include lease security deposits, tenant improvements, and signage. Fixed assets (sometimes called capital expenditures), for furniture, equipment, vehicles needed to set up your location and start your business. These assets include computers and machinery, and anything for your office that is needed to set up your business. Materials and supplies, like office supplies, advertising and promotion materials. You will need an initial supply of these to get started. Other costs, like the initial attorney and accounting set-up fees, licenses and permits, insurance deposits, and fees to set up your business type. In your listing of these startup costs, include items you are contributing to the business, like a computer and office furniture. Note these items so you can get credit for them as collateral. It will be easiest to get a cost per unit sold for the next step. Likely scenario, somewhere in between. The likely scenario would be the one to show your lender. To be realistic in your budgeting, you must assume that not all sales will be collected. Depending on the type of business you have and the way customers pay, you might have a greater or smaller collections percentage. Include a collections percentage along with your estimate of sales for each month. For example, if you estimate sales in Month One to be $50,000 and your collection percentage is 85%, show your cash for the month to be $42,500. Calculate the variable costs of sales for each month based on sales for the month. For example, if your estimated sales for a month are 2,500 units and your variable costs are $5.50 per unit, total variable costs for the month would be $13,750. Add monthly variable costs to monthly fixed costs to get total monthly costs (expenses). You might want to calculate your break-even point to include with your budget. The $2,150 represents your total cash balance for the month, not your profit. By changing your sales figures using the three scenarios above, you can see the result in your cash balance at the end of each month. This cash balance can give you information about your cash needs and how much you might need to borrow for working capital. Use your accounting software program to create your budget, so you can use existing accounts and make changes more easily. If you don't have an accounting software program, you can use a spreadsheet program. 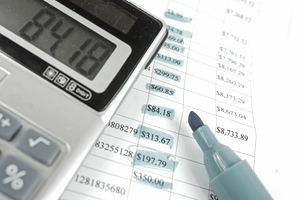 Most lenders require three years of cash flow statements on a month-by-month basis, and three years of quarterly and annual Income Statements (P&Ls). Income taxes are a variable expense, and you don't know what taxes you will have to pay until you calculate your net income. Don't include taxes in fixed expenses or variable expenses but make these a separate category. An accounting software program or spreadsheet program. Information on the costs associated with sales of products.